The now-decommissioned Mirant Potomac River Generating Station (MPRGS), located in Alexandria, Virginia, operated from 1949 to 2012. When the power plant was constructed one mile south of Ronald Reagan Washington National airport in the 1940s, the Federal Aviation Administration (FAA) required that the facility be built with shorter than normal exhaust stacks to avoid possible obstruction hazards for arriving and departing aircraft. Twenty-five years later, developers built the Marina Towers high-rise condos immediately adjacent to the power station. Site-specific modeling and atmospheric boundary wind tunnel testing were still in their infancy in the 1970s, so the high rise was constructed without the benefit of such predictive techniques. Fast forward to the mid 2000’s – Mirant, owner and operator of MPRGS, submitted a report to the Virginia Department of Environmental Quality entitled “A Dispersion Modeling Analysis of Downwash from Mirant’s Potomac River Power Plant,” which predicted unusually high sulfur dioxide (SO2) concentration near the roof of Marina Towers and at ground level along the fence line. Mirant had used the United States Environmental Protection Agency’s (EPA’s) own AERMOD software to estimate the pollutant concentrations, but figures suggested that the power plant’s five coal-fired boilers exceeded the National Ambient Air Quality Standards (NAAQS). It was well-known, however, that AERMOD commonly overestimates pollutant concentrations for many building configurations, so Mirant approached CPP’s air quality experts for answers. Our engineers suggested a novel technique that relies on wind tunnel testing to improve how AERMOD characterizes building wake effects. Our study found, and field measurements confirmed, that pollutant concentrations at the Marina Towers were, in fact, much lower than what AERMOD had predicted. Furthermore, acceptable levels were now within reach using emission control technology. Merge two or more structures into one large structure. Select relatively insignificant features as representative of an entire building. Incorrectly locate the building relative to its surrounding environment. Make a single small building into a very long and wide building. 1:300 scale model of Mirant installed in one of CPP’s wind tunnels, located in Fort Collins, CO. Equivalent Building Dimensions (EBDs) offer a more accurate, but still conservative, way to improve the inputs to AERMOD. 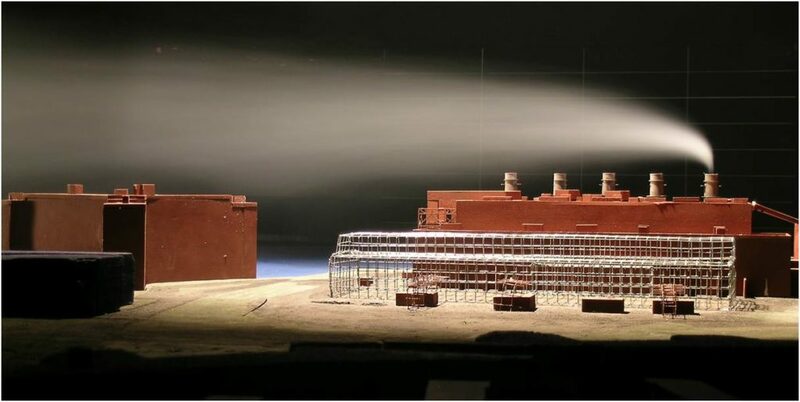 Instead of creating AERMOD’s geometry inputs with BPIP, we study a scale model of the building itself in the wind tunnel. A series of wind tunnel tests then reveals dimensions for a simpler box-shaped building that creates the same wake effects as the building itself without the issues associated with BPIP. To that end, CPP’s engineers designed and constructed a 1:300 scale model of the MPRGS power station and its surroundings and instrumented the model with tracer gas sources and receptors. We then situated the model in the atmospheric boundary layer wind tunnel, released tracer gas from sources at the power plant’s stacks, and measured the resulting concentrations at receptors located at key locations around the Marina Towers complex. We also noted the shape and nature of the plume itself. Then we replaced the model of the actual building with a series of simpler (equivalent) box-shaped models until we found a configuration that created the same downwind pollutant concentrations, as well as the same plume shape. Once we identified a simpler shape that produced the same dispersion behavior, we recorded the dimensions of the box and moved on to the next wind approach direction (The equivalent building dimensions vary with wind direction). Measuring concentrations with Mirant site structures for 36 wind directions. The end result of this method was a set of equivalent building dimensions (length, width, and height) for each wind approach that created the correct pollutant dispersion behavior downwind. To further improve the fidelity of our EBD models, we even created completely separate data sets for receptors at the high rise itself and at ground-level locations nearby, allowing for much more accuracy than considering the two of them together. We then worked with Mirant to run their AERMOD model using the EBDs we determined in the wind tunnel study. AERMOD with EBDs predicted pollutant concentrations that were less than half of those that Mirant had originally calculated. But was this too good to be true? To find out how closely our EBD model approximated reality, David Shea of ENSR Corporation (now part of AECOM) conducted field research at the power plant itself and took detailed measurements of the actual pollution levels were. Six monitoring stations were placed in and around the complex, which recorded sulfur dioxide levels during a variety of weather conditions. Shea’s field data showed that CPP’s wind tunnel study yielded valid EBDs that more accurately matched the real-world values. In fact, the highest concentration level that Shea observed was even less than the lowest result we obtained using the EBD approach. Based on CPP’s research and Shea’s measurements, we found that even though the EBD method estimated lower concentrations than the standard AERMOD approach, the method was still conservative and offered a healthy error cushion compared to real life conditions. On July 31, 2008 the VDEQ issued an operating permit for the power station based on these results, which it accepted in full. And in order for the VDEQ to issue that permit, the EPA had to agree to using the wind-tunnel-derived EBDs as inputs to AERMOD. But despite conclusively demonstrating that the Potomac River Generating Station operated within the EPA’s limits, Mirant chose to shut it down in 2012 citing a market shift from coal to renewable technologies like solar power. The Mirant case study nonetheless remains a valuable example of how a novel approach can help our clients achieve compliance with EPA regulations.